But, I just wanted to recollect all the good things that happened in 2016. Sayed Yes to new. In general, I try to think a lot before taking a new step, but from the beginning of the year, I tried to say yes to new. The most impactful one was when my office inquired if I wanted to work in Ahmedabad and I said yes in one second. That decision came as a boon because I got to travel a lot for the same reason. Traveled. ✈ I went to several places for the first time in my life like Daman, Silvassa, Rishikesh, Ahmedabad, Nagpur, Bhopal, Sachi, Surat. I even discovered more areas in cities I have already visited like Colaba and Fort in Mumbai and Majnu Ka Tilla in Delhi. I ventured out a lot on my own as well. I even revisited Essel World and Water Kingdom on Christmas Eve (first time was in 2000!). Tried adventure sport. 84 meters bungee jumping, 1 km flying fox, and 26 km river rafting all in one weekend. Another memorable one was to hike up a volcano in Bali in the moonlight. It was tough to say the very least. I had just recovered, and my body was not helping me climb up 1700 meters. I have already done scuba diving in Andamans and were short of time so, skipped that in Bali. Planned and executed an international trip. 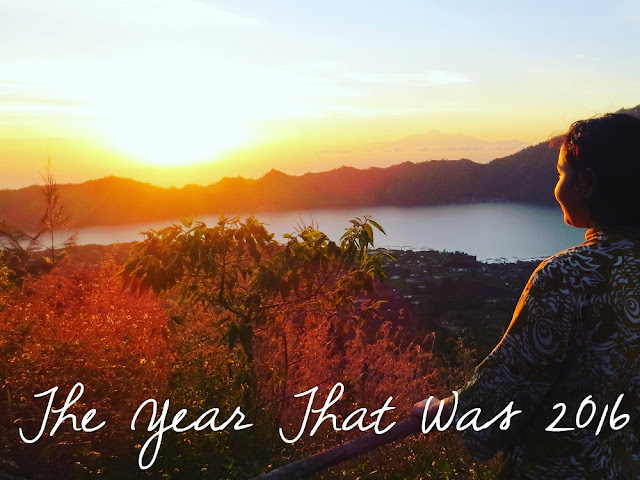 Bali will always be more special because not only it was my first international trip but also the one I planned with little or no help. With a body recovering from jaundice, I planned the stay at Bali and tried the best I could to create a memorable trip in very short time. Controlled my shopping. Instead of always running after new launches and new products, I controlled by shopping urges. My motivation was - "Instead of paying Rs 1000 for this lipstick for which my love will most probably die down in a month or so, I can spend it on things that will create a beautiful memory - good food on the beach or handcraft item from an exotic location." I spend that money on travel. I shopped majorly only when I got the best deals (I went berserk at MAC at Malaysia Aiport) or when I was aware that I could not get them again like Bipha Ayurveda or Local brands of Bali or Innisfree. Used more natural skincare. This is a long battle, and I am fighting for long. There aren't many options. Luckily, I found more brands this year which strive to give the best. I will do another post with this. Malwani - Thanks to Ila. I got goosebumps when I heard what goes into Sol Kadi. Imagine what happens when I drink it. Andhra - Thanks to hubby who took me to Andhra Bawan in Delhi. The taste still lingers on my tongue. Irani/Parsi - Thanks to Rini. Indonesian - So much variety, just one plate. As you can see, most things are travel related. 🙊 I am sure that I am missing several things, so I will add them whenever I recall them.